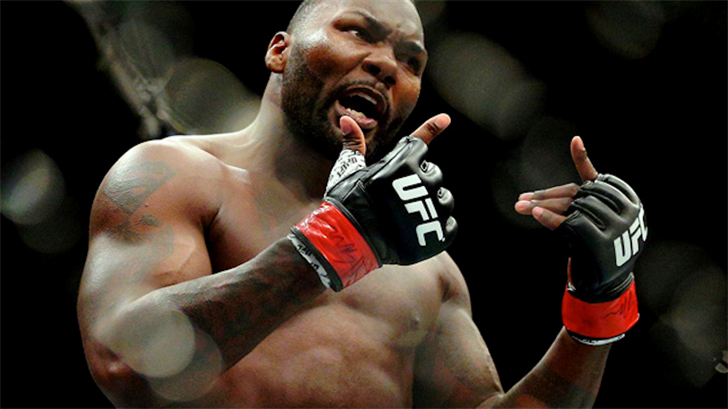 Anthony "Rumble" Johnson was the first one interviewed following his light heavyweight championship bout loss to Daniel Cormier, something unusual and unseen in the sport during the post-fight remarks. With tears in his eyes, Johnson stood in the middle of the KeyBank Center, told his coaches, fellow UFC personnel and fans that he loved them, and — suddenly and surprisingly — announced his retirement. "This was my last fight," Johnson said. "I gave my commitment to another [non-MMA related] job. Time for me to do something else." Johnson retires in the prime of his career, just turning 33 and competing in 28 professional MMA bouts. Johnson debuted in the sport with a TKO win in just 1:09 on August 16, 2006. In his fourth fight, he would make his debut with the UFC, scoring a knockout over Chad Reiner in just 13 seconds at UFC Fight Night: Stout vs. Fisher. After losing two of three, Johnson went on a three-fight winning streak before a loss at UFC 106 to Josh Koscheck, a bout that earned Fight of the Night honors. Johnson would then score victories over Dan Hardy and Charlie Brenneman before losing to Vitor Belfort at UFC 142. Despite two Knockout of the Night performances, Johnson struggled with making weight throughout his first UFC stint. In fact, Johnson missed weight three times, including the fight against Belfort, where he weighed in 11 pounds over the weight limit and just made a strict 205-pound limit for him to compete at. Johnson was released following the bout with Belfort. After three wins on the independent circuit, Johnson was one of the fighters who signed on with the World Series of Fighting and competed at the very first WSOF event. In his three bouts, he faced D.J. Linderman, former UFC heavyweight champion Andrei Arlovski and former UFC and Strikeforce fighter Mike Kyle. Johnson won all three bouts. Johnson was then re-signed to the UFC, returning at UFC 172 with a unanimous decision win over current Bellator light heavyweight champion Phil Davis. Johnson then won his next bouts, scoring wins over Antonio Rogerio Nogueira and Alexander Gustafsson, earning Performance of the Night bonuses in both bouts. After Jon Jones was stripped of the light heavyweight title for a hit-and-run incident, Johnson stepped up to face Daniel Cormier for the vacant title at UFC 187. Johnson lost via third-round submission. Johnson then scored wins over Jimi Manuwa at UFC 191, over Ryan Bader at a UFC Fight Night in January 2016, and over Glover Teixeira at UFC 202. He was scheduled to face Cormier for the light heavyweight title again at UFC 206 back in December, but an injury to Cormier postponed the bout until UFC 210. After the second-round submission loss, Johnson called it a career, taking everyone by surprise. One has to wonder what is next for Johnson in his life, as well as the fate of the UFC light heavyweight division — which suddenly got one talented fighter shorter.